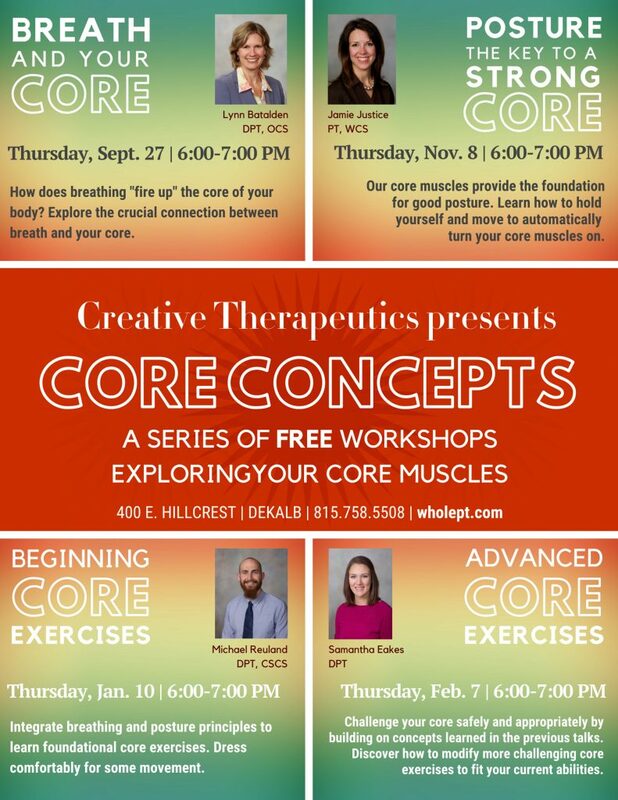 Core Concepts | New Free Workshop Series! Regular readers, patients and students know we’re always talking about the core: those muscles in the abdomen, back, bottom, and pelvis that provide stability and help drive so much of our movement. A complex system of muscles comprises our core, some of which–like the diaphragm, for example–operate below the surface, often being overlooked compared to showier neighbors like a “six-pack” of abs. Yet all these muscles are crucial to functional movement and preventing injury. In the third of our four-part series on the core, we’ll integrate breathing and posture principles to learn foundational core exercises. (Don’t worry if you haven’t attended our first workshops–we’ll catch you up!) Dress comfortably for some movement. Workshop is FREE and open to everyone. This entry was posted in Publication, stretching, Women's Health, Men's Health, Physical Therapy, training, exercise and tagged core, core strength, physical therapy, pelvicore. Bookmark the permalink.